A memorial to William "Baldy" Floyd. Photo by Jon Hughes/Photopresse. 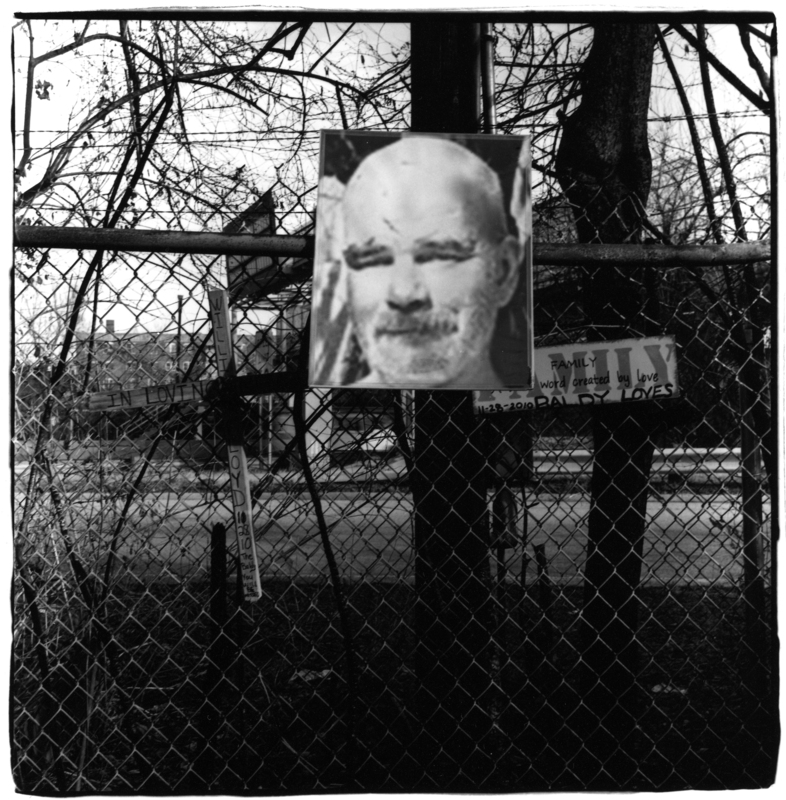 Photographs of Baldy proliferated following his death in a fire Nov. 28, 2010. Makeshift shrines testified to the fact that he was well known among his homeless neighbors. The photos show him smiling, giving no indication of the horror that attended his final minutes. To get a sense of what happened, one can look at the last photographs ever taken of Baldy, as William Floyd was known. But they are not for the faint of heart. The photos show a charred corpse, blackened like a piece of meat left too long on the grill, one arm and the stump of the other – the remainder having been burned off – raised upright, as if pleading to heaven for help. The Hamilton County Coroner ruled the death accidental, the result of smoke inhalation. He had a carbon monoxide saturation of 33 percent. Cutaneous burns were a contributory cause of death. Baldy, 44, was so badly burned that “the facial features are non-discernible.” His left forearm and left foot were burned off. His scalp was gone. He died within minutes, according to his autopsy. Toxicology reports showed he was so drunk, in addition to having valium and marijuana in his system, that he likely felt nothing. Dispatch records show that the first call about a fire came in at 9:58 p.m. Five minutes later dispatchers were advised of heavy flames: “May get a lot of calls.” Passing drivers did, in fact, call 911. At 10:10 p.m. firefighters at the scene reported, “Possible victim.” Fourteen minutes later came the news, “One fire victim, fatality.” He was pronounced dead at 10:30 p.m.
Baldy had been warned that night, according to witnesses. He was visiting Lee Carpenter and Tammy Alter. Carpenter’s hand-built stood a house just a few dozen yards from the shack Baldy inhabited. “When B came down that day, he had his fire going for a little bit,” Carpenter said. “And we had come down and looked at it, you know, and knocked it down a little bit because he was sitting down there with us. I said, ‘That’s a bad thing to do. Don’t ever walk away and leave the fire going next to your house without you – somebody being there.’ I said, ‘You’re asking for an accident.’ So we knocked it down. Alter, the last person to see Baldy alive, called the fire department on her cell phone. She vividly remembers the night of the fire. She also remembers cracks she had made about his dilapidated shack. Carpenter was burned trying to rescue Baldy. “The inside was totally engulfed,” he said.” I’m standing inside of it in an inferno. She watched me run through a wall of flame, and she’s screaming her head off. I got to this point, went to reach in and try — well, I was actually going to try and take a step, grab his foot and drag him out. And as I reached in, the roof of his house collapsed. “I stood there like a deer in the headlights watching the fire,” she said. “And screaming at me because she figured I was going, you know, I was going right along with him,” Carpenter said. Firefighters needed about 30 minutes to extinguish the blaze, according to Carpenter. One of Alter’s kittens also died in the blaze. The total property loss from the fire, the net value of William “Baldy” Floyd’s earthly possessions, was estimated at $100.